Praktica is a unique top hanged sliding glass doors system. The hanging fittings and rollers are concealed in the upper track giving the "total glass" look to the moving panels and the opening, as the upper track has a special premade glazing groove for the fix side panels if needed. Standard hanging set includes 2 hanging fittings equipped with 2 rollers each. Maximum weight per wing: 90kg. Minimum width of wing: 680mm. 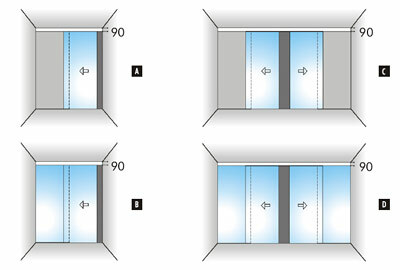 Heavy doors hanging set includes 2 hanging fittings equipped with 2 rollers each. This item is made specific to size. Maximum weight per wing: 150kg. Minimum width of wing: 1000mm. 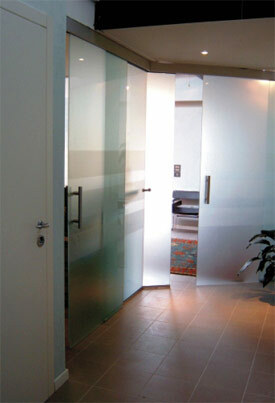 Glass thickness: 10-12mm. Andere afwerkingen van het aluminium op aanvraag.